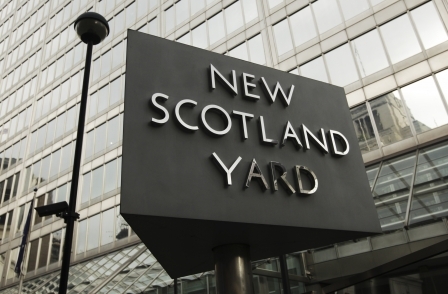 A member of police staff based at New Scotland Yard has been arrested by detectives investigating alleged corrupt payments to public officials. The 55-year-old man and a woman, aged 48, were held at their Berkshire home by officers from Operation Elveden, Scotland Yard said. They were arrested at around 5am on Tuesday on suspicion of conspiracy to cause misconduct in public office and are being questioned at police stations in west London. The latest arrests bring the number of people held under Operation Elveden to 74. The investigation is being run alongside two other inquiries led by Scotland Yard – Operation Weeting, that is looking at alleged phone hacking, and Operation Tuleta, that focuses on computer hacking and other alleged privacy breaches. In August the force revealed that a total of 38 people had been interviewed under caution as part of the three operations, in addition to the arrests that had been publicised. This included 19 people who had been questioned under Operation Elveden. Watchdog the Independent Police Complaints Commission has also made its own three arrests under inquiries linked to the investigation.